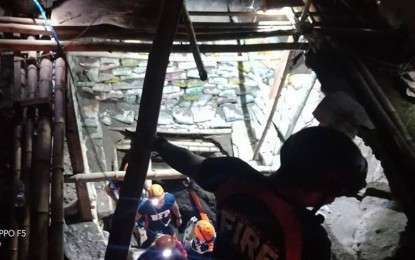 DUMAGUETE CITY -- Retrieval operations continued on Thursday, January 03, for three suspected treasure hunters trapped inside a tunnel after the ground collapsed Wednesday in Purok 4, Barangay Boloc-boloc in Sibulan, Negros Oriental. Councilor Jon Rey Abada, designated Public Information Officer (PIO) at the scene of the incident, said that as of Thursday, retrieval operations continue with heavy equipment digging close to where the three are believed to have been buried. “Based sa measurements nga gihimo gahapon sa rescue operations, ang tunnel mga 35 feet deep ug naa sa mga 13.5 meters horizontal (Based on the measurements done yesterday during the rescue operations, the tunnel measures about 35 feet deep with about 13.5 meters horizontal-wise),” he said. The victims were believed to be in search for gold and diamonds, authorities said. A fourth member of the group was rescued on Wednesday. Three are still missing, identified by their next of kin as Feliciano Encilay, Sr., 62, an employee of the Provincial Veterinary Office who is due for retirement and a resident of Cervantes Street in this city; Algie Javier, 29, a former Overseas Filipino Worker (OFW), who reportedly owns a gold detector used in the alleged treasure hunt and a resident of Barangay Isugan in nearby Bacong town; and a certain Bobby Baldado of Palinpinon in the adjacent municipality of Valencia. The survivor was identified as Mauro Alforque, 44, a resident of Aldea Homes here, who narrated to the police that he was designated as the “lightsman” of the group. He recounted that he witnessed his three companions, situated about eight feet away from him, being buried when clay and sand from above collapsed while they were trying to establish a support system for the tunnel before proceeding further inward. According to Alforque, his body was half buried by the rubble but fortunately, he was able to free himself, leaving the three behind whom he believed were already dead. Abada said they received the call-out around 11:40 a.m. Wednesday, prompting the Sibulan Disaster Risk Reduction and Management Council (DRRMC), the police, and other Search-And-Rescue (SAR) groups to proceed to the scene. The rescue operation was called off at midnight due to the high risks posed by the presence of water in the tunnel, he said. Ongoing retrieval operations involve at least three heavy equipment sent by Dumaguete City Mayor Felipe Antonio Remollo, a payloader, two backhoes, and a dump truck. Bureau of Fire Protection (BFP) rescuers, headed by Supt. Mary Joy Candelario, were able to penetrate the ground underneath but could not go any further because of a body of water between them and the area where the tunnel had collapsed. Abada said submersible pumps were brought in to draw out the water, but in the end, they decided to dig from the opposite side, making estimates above ground based on horizontal measurements of the tunnel. As of Thursday evening, the digging already reached about 22 feet and once they go deeper, horizontal digging will commence manually, he said. Sibulan Mayor Jose Pepe Abierra personally supervised the retrieval operation early Thursday morning, with his DRMMC, headed by Josephine Barraquias as the incident command center commander. Provincial Disaster Risk Reduction and Management Council (PDRRMC) executive officer Adrian Sedillo also assisted in planning the retrieval operation. Meanwhile, initial investigation showed that the lot where the excavation originated was bought by a certain Christine Singh from one Ramon Iso sometime in May last year. For more than six months, digging continued vertically before proceeding northward horizontally. At ground level, it appears the tunnel has reached the other side of the road, prompting rescuers to negotiate with the lot owner of C & L Enterprises to allow them to dig from there. Councilor Abada said they could not yet conclude whether the three men are dead although “chances are slim”, based on estimates from a doctor on the time spent underground as well as other prevailing conditions. “Mao gani niabot na pod ang Mines and GeoSciences Bureau ug nisulti nga mostly pag ingun ani nga incident, lisod nga mabuhi (The Mines and Geosciences Bureau personnel have also already arrived and have said in instances like this, chances of survival are slim) although we cannot really conclude (kay usahay naa man pod mu survive) as sometimes some people do make it out alive,” he said.